Many people dismiss the idea of getting a rescue dog due to the paranoia of ending up with a dog with “baggage”, or because they don’t want to miss out on the cute puppy phase of development. It is often assumed – or hoped – that obtaining a puppy means it can be shaped into the dream dog. But the realities are quite different: 1 in 5 people who buy a puppy don’t have that puppy 3 years later. Even well-researched puppies with experienced owners are not immune from developing behavioural problems. Many rescue dogs are looking for new homes because of family illness or death, or because they shed too much hair on the carpet, or they no longer match the new curtains (yes, really). 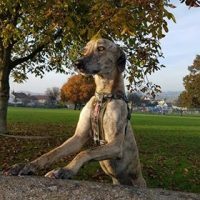 All dogs from a reputable rescue can be matched to a home to suit. All should provide behavioural modification for any dog who requires it as well as follow-up support to owners once a dog is in a new home. “Rescue dog or puppy? The first half of the battle was trying to convince my husband to have a dog – now the only battle is keeping them apart! After weeks of convincing him to have a dog, he finally agreed on the condition that it was a puppy. One day we decided to go to a local rescue – Hollyhedge Animal Sanctuary – to see what puppies they had for adoption. It was love at first sight – we both fell madly in love with Prince… and Prince wasn’t a puppy. We were informed that Prince wasn’t going to be an easy dog. He was stressed and anxious living in kennels – after all, he had been there most of his life. When we first interacted with Prince he showed various behavioural problems and jumped up at me barking. I wasn’t phased by his reaction – it was only day 1. After leaving Hollyhedge and having a long hard talk with my husband, we knew that Prince needed our love more than the average puppy. Although we originally wanted a puppy to watch it grow into our family, we knew it would only be as hard as having a rescue dog. Puppies need a lot of care, attention and energy; toilet training, basic training, teething, exciting energy 24/7. Prince needed a committed family to teach him how to trust, to love and be loved. To feel safe and secure. Whether you introduce a new dog or a cute puppy into the home, the first few days or weeks can often be a challenge. Adopter’s remorse is a perfectly normal response, but usually the cuteness of the puppy makes this period easier. But they don’t stay small and cute for long! It is common for rescue dogs to follow a rule of three: 3 days where they are often inhibited in their behaviour as they adjust to their new surroundings, 3 weeks to settle in and feel they are ‘home’ and 3 months until they start to fit into your routine… they might not have those puppy eyes, but they will always look at you with eyes that say “thank you for rescuing me”. Please, consider adopting from your local rescue rather than be tempted by adverts of cute puppies. “They need it – and deserve it more” – what a brilliant way to sum it up.